HAMEL SAILS - Passion for sailmaking! It all started in 1978 when Hans Hamel set up his own production. The goal was to develop sails on his own sailing experience together with feedback from the customer. Today his broad experience goes from dinghy- to offshore sailing including many victories and titles. This is one of the keys to successful sailmaking and has taught him all the different design and needs that goes in to a sail. All these years and the passion for sailing and sailmaking have successfully brought sails to all kind of sailors like weekend ,blue water, club race and grand-prix customers. 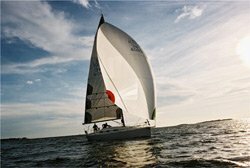 The company was during 1988 to 2005 also manufacturing all Elvström sails for the Swedish market. We have lately seen a trend towards mass production and simplifying, to offer an alternative to this the company the company has taken a new step. Hamel Sails is now independent and the company has taken the step to a new high level of sailmaking. This based on investments such as new manufacturing facility, new machinery and design software. A step in the same direction was our purchase of Doyle Sails Sweden in 2002. With this followed Bengt Lindholm, sailmaker with big boat- and almost 30 years of worldwide sailmaking experience. His unique knowledge is not only the sail design it include all the things that is related to sails and sailing. In his cv we find sailing titles like World-European- and National champion. Today his broad experience goes from dinghy- to offshore sailing including many victories and titles. This is one of the keys to successful sailmaking and has taught him all the different design and needs that goes in to a sail.